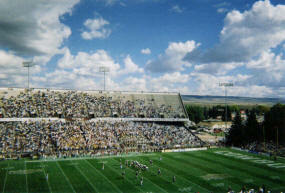 Since my visit to War Memorial Stadium in 2004, the amenities have been updated to match the rest of college football’s landscape. 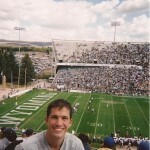 One of my favorite moments was going down to field level behind the goal posts. There is a lot of freedom at War Memorial Stadium and many fans abandon their assigned seats to get an up close view behind the fence near the end zone. I witnessed a score right up close, but what followed was hilarious: The kicker set up for the extra point and the net that catches the ball began to raise up behind the goal posts. However, when the kicker successfully kicked the ball through it became clear that the net was not tall enough. The ball flew right over the net, over our heads, and hit the scoreboard breaking a light bulb in the process. Hopefully part of their recent stadium upgrades included taller nets. Die-hard fans are not difficult to find in these parts. 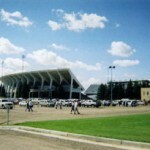 The tailgating is excellent around the stadium and fans cheer, “Cowboys! Cowboys! Cowboys!” loudly and proudly. 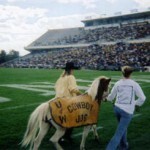 “Ragtime Cowboy Joe” plays often and the mascot, a brown and white Shetland pony, circles the stadium with each Wyoming score. 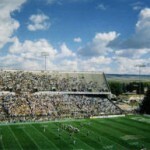 War Memorial Stadium is a perfect example of why college football is so great. 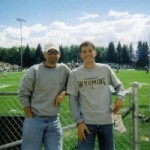 The city of Laramie can hardly be located on a map, but it still holds an important piece of the fabric of this great sport. 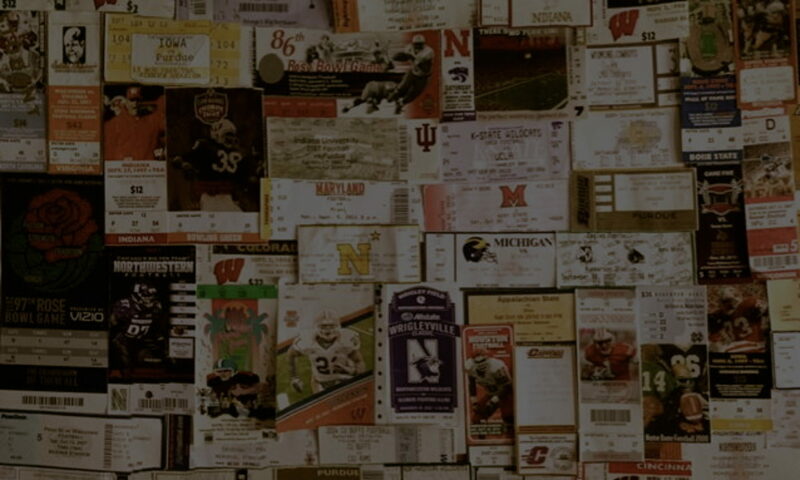 It may not be Michigan Stadium, but its quaintness, culture, and enthusiasm make it an intriguing venue to visit.